We’d love your help. 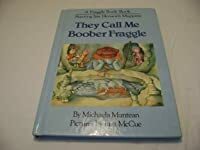 Let us know what’s wrong with this preview of They Call Me Boober Fraggle by Michaela Muntean. Unlike all the other Fraggles (furry, fuzzy creatures the size of monkeys) living in Fraggle Rock, Boober is a natural worrier and he begins to worry even more when he realizes that his fellow Fraggles think he is a depressing wet blanket. 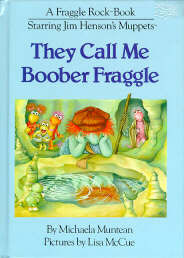 To ask other readers questions about They Call Me Boober Fraggle, please sign up. Boober was always my favorite. He was the Eeyore of Fraggle Rock, always worrying about this thing or that. In this little hardcover given to me in 1984 and inscribed by my grandmother, Boober worries about what exactly makes him special. All of his friends have something special: Gobo is adventurous, Wembley is happy and easygoing (and essentially Wash from Firefly), Mokey is the poet, and Red is the life of the party. But what--other than socks and laundry--is Boober good for? I have a special Boober was always my favorite. He was the Eeyore of Fraggle Rock, always worrying about this thing or that. In this little hardcover given to me in 1984 and inscribed by my grandmother, Boober worries about what exactly makes him special. All of his friends have something special: Gobo is adventurous, Wembley is happy and easygoing (and essentially Wash from Firefly), Mokey is the poet, and Red is the life of the party. But what--other than socks and laundry--is Boober good for? Boober, being a naturally suspicious Fraggle, finds his friends talking about him by the Fraggle Pond and he hears them say that they don't need him. He hears what they're saying and takes it to heart, and realises that what they're saying is actually true. So he goes on a self-improvement campaign,but of course, with Boober being Boober, it doesn't go as planned, so what can he do? Is his life over? Read to find out!